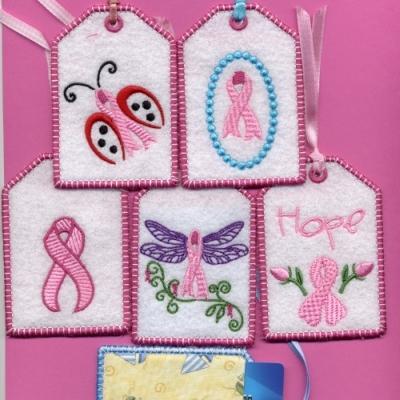 These darling “For The Cause” Tags, created by Lyn Christian, have a multitude of purposes. They make great gift tags for wrapping up presents, you can use them to “wrap” a gift card or cash, or they can even be decorative. They also can be used as luggage tags, hung from a door, or tucked in a gift mug. They have special meaning to anyone who has been touched by breast cancer. You get four tags per set and it’s done in the hoop. Full photo instructions come with each set. These tags are easily crafted from felt, a starched fabric, or any material that won’t easily run. Add a simple tearaway stabilizer such as HTC 1.5-ounce tearaway, 3190, http://www.htc-retail.com/search-results.php?keyword=3190&timestamp=1325713486, and you are set to go. Grab those buttons, crystals, or glitter paints to make them special. In most cases, designs are emailed within 24 hours. You can also choose to have them mailed to you on a CD. Go to http://www.adesignbylyn.com.